Dinner for a crowd doesn’t get much easier than these Crock Pot Baked Potatoes! Need a quick and low effort meal for serving a group of people? I’ve got just the thing. 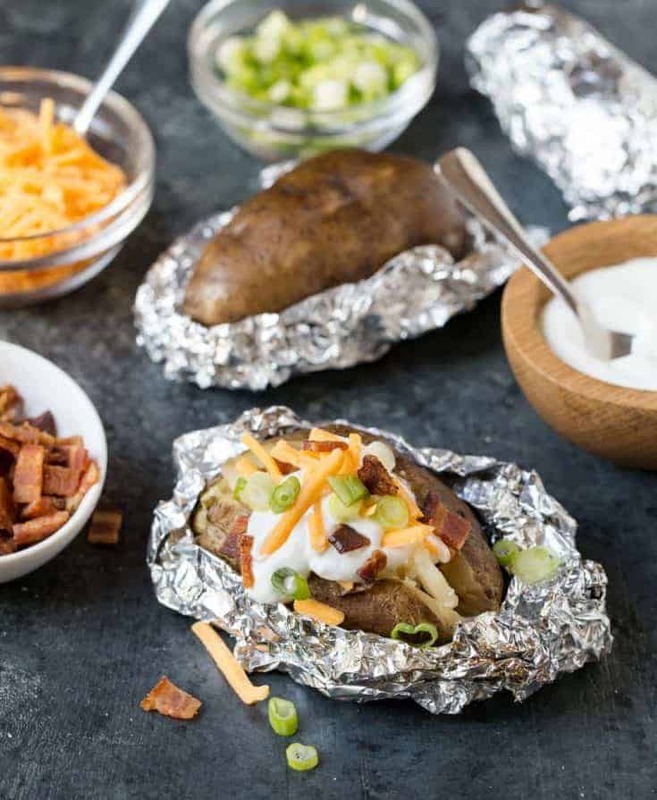 Set up a baked potato bar with these Crock Pot Baked Potatoes. Spread out everyone’s favorite fixings, and let your friends and family loose to load up their spuds just they way they like them. Expect to see a slightly darker spud than your average baked-in-the-oven potato. It’s because the olive oil permeates the skin during cooking in the crock pot. You’ll still have super yummy potatoes, but they’ll have a little different hue. These potatoes have more of a steamed rather than fluffy texture due to the slow cooking method. Again, this is a matter of preference, but I’m betting you won’t notice much difference when they are piled high with your favorite baked potato toppings. Scrub potatoes and allow to dry completely. Generously rub potatoes with olive oil, sprinkle with salt and wrap individually in foil. Place in large crock pot and cook on low for up to 8 hours. Since crock pot times can vary, you may want to check your potatoes after 6 or 7 hours to see if they are cooked through. It’s definitely one of those “why haven’t I thought of this before?” moments, Willow! Hope you like it, Shelly! Love this!! I have NEVER thought about cooking potatoes in the crockpot. Genius!!! I know what you mean, Nicole; it never crossed my mind, either. But definitely worth doing! 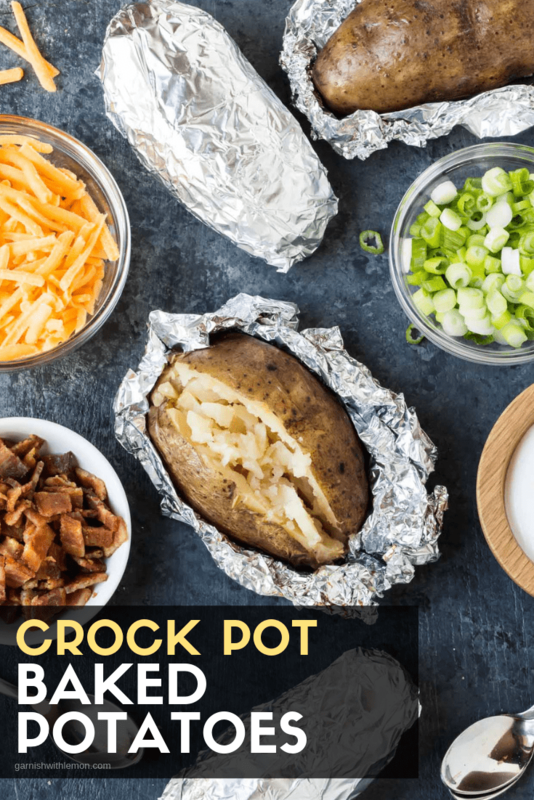 I love this idea–I have never tried crockpot baked potatoes! Especially good with a family to feed and little time! Will you get the same results if you cook on high for 2-3 hours? Hi Meredith, I haven’t personally cooked these potatoes on high. In fact, I’ve read comments by others who have tried, and some of their ceramic pots cracked from the heat/lack of liquid at the higher temps. If you give it a try, please let me know how it works! Totally doing this for Halloween. I am pretty sick of pizza, so this is a great alternative. My kids have potato bar at school (and they love it), but I’ve never done it at home. It’s time to start – esp. since I can put those potatoes in the crockpot! Excellent! Sometimes it’s just nice to have another option besides pizza. 🙂 Happy Halloween to the Lochners! I just recently discovered my kids actually like baked potatoes!! This changes everything! I cannot wait to serve up these crock pot potatoes! Isn’t it funny how they can surprise us with their taste (and distaste) for food sometimes? Happy potato topping! I made them the other night. I had some leftover roast beef and gravy. I poured this over the top of the baked potato. it was a easy meal for one. Perfect! Love the creative variation, Karen! I totally love this idea. What a great way to make busy nights less stressful. I am going to try with sweet potatoes. Yum! Love the idea of using sweet potatoes! I never would of thought of using a slower cooker, and that baked potato looks awesome! Perfect for Sunday games. Isn’t finding a new tip or trick the best? Love that! Can you layer the potatoes in the crockpot, in other words, cook more than 6? Hi Judy, Anytime you double a recipe, it can impact the cooking time. If you layer the potatoes, I’d suggest rotating them halfway through cooking so they cook evenly. Check for doneness before removing and tack on a bit of cooking time if needed. Hope that helps! Since I am a novice when it comes to cooking, how would I go about checking to see if they were done? Hi Paul, Thanks for your question. Just stick a fork in the potatoes and when it goes in easily and the inside is soft, they are done. Good luck! I love this idea, what an awesome easy side when you don’t want to turn on the oven! Thanks, Holly. Gotta love a good shortcut! We do this while camping. Throw them in the crockpot before we go fishing for the day. Works great. So glad this works for you, Lori! This is a great idea. We like to have baked potatoes when we cookout on the grill. So I could put the potatoes in the crockpot early in the morning and they would be ready in time for when the food from the grill is done. My husband is a big sourcream and butter fan, but my son loves to use Italian dressing in place of the sourcream and butter. As for myself, I just like baked potatoes period. Thanks for the wonderful idea Lisa and Anna!! Exactly! No need to heat up the house, either. Enjoy them this summer, Judy! 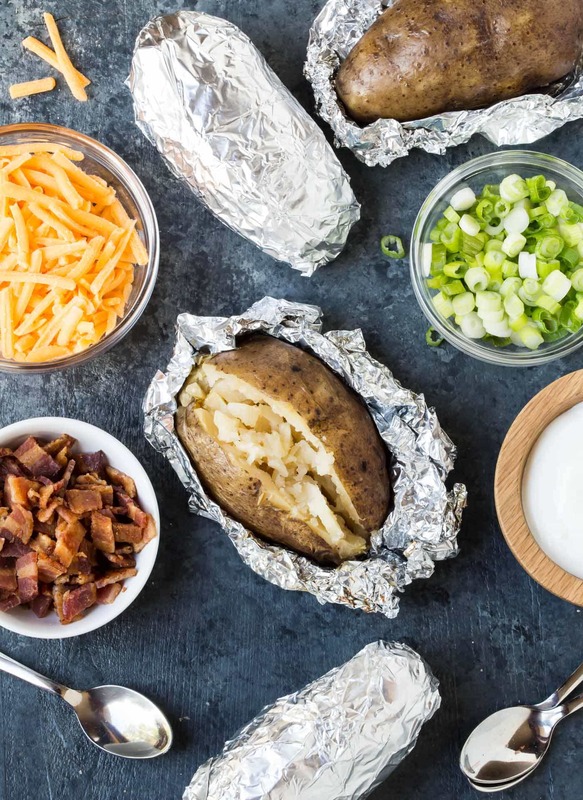 I love baked potatoes-russet, idaho, sweet potatoes-but I love the skin nice and crispy so when I bake them I don’t wrap them in foil. Will the olive oil help make them crispy even if they are wrapped in the foil? No, these do not get crispy skin like they would in the oven without foil. If you’re a stickler for that texture, you’ll have to continue with the oven baked method. Hope that helps! I am a great fan of pressure cookers and will give this a try in a pressure cooker with water under the tray holding the wrapped potato. For a crisp skin place in toaster oven and broil rotating potato till crisp. Will corn oil work rather than olive oil. And. Bake potatoes w/o water in the crock-pot? My favorite meal is a baked russet with butter and hot stewed tomatoes on top. Delicious! Hi Linda, I usually make these in larger quantities, so I’m not much help when it comes to only making two. If it were me, I’d check them between 5-6 hours and see how they are doing. Let us know how they turn out!